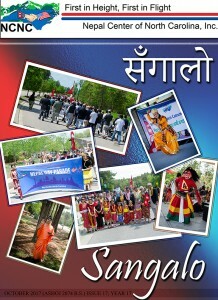 The 17th issue of our annual magazine SANGALO was released during DASHAIN celebration last Saturday and is available for you. Several members were able to pick their copy during the DASHAIN celebration. If you could not make to DASHAIN party and need to collect your copy of SANGALO, pleas contact any of the NCNC BOD members or SANGALO editorial members and secure your copy. As you know, SANGALO has been consistently delivering information about several community activities and matters of personal interests and needs through various ways. This magazine provides a true reflection of our community activities in the form of pictures, articles, greetings, advertisements etc. The magazine also includes information about past and upcoming events, reports on cultural activities and other activities of the NCNC during the past year and an official annual financial report of the NCNC. The digital copy of SANGALO is available here.